Steam boiler system is referred to the boiler which converts water into steam at a required pressure. These boiler systems are used in many industries such as refineries, power plants and others. Steam boilers are also used as generators to produce electricity. In water tube boiler by boiler type, the steam is produced by heating the water inside the tube which is surrounded by hot gasses. Water tube boilers are used for high pressure steam applications. The global steam boiler system market is expected to grow at a CAGR of 5.2% over the forecast period i.e. 2017-2024. Further, steam boiler system market is anticipated to reach USD 15.1 billion globally by 2024. This significant growth can be attributed to various factors such as rise in demand for energy across the globe and favorable government initiatives aiming for the adoption of steam boilers for energy. 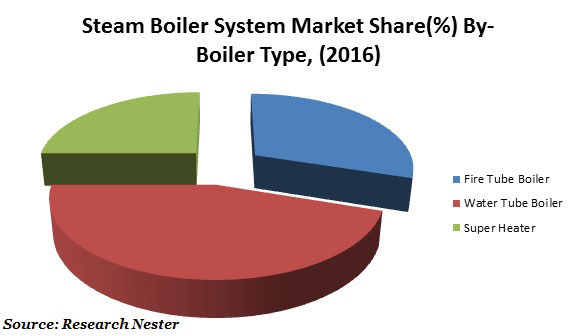 In the regional platform, North America is the largest market in terms of market revenue share in overall steam boiler system. Further, this region is expected to continue its dominance by the 2024. The market of steam boiler system is majorly driven on the back of the increasing use of steam boilers systems in refineries, power plants and others. Moreover, the rising demand for steam boiler systems in commercial and residential heating purposes is also envisioned to bolster the growth of steam boiler systems in this region. Likely, U.S. holds the largest market share of steam boiler system owing to the growing food processing industry. Rising demand for energy across the globe and large scale requirement of steam boilers from power plants, refineries and others are believed to be the dynamic factor behind the growth of steam boiler system market. Further, increasing use of steam boiler systems by food processing industry is also projected to boost the demand for steam boiler system. Moreover, favorable government initiatives for the usage of steam boilers systems and providing incentives in terms of subsidies are envisioned to bolster the growth of steam boiler system market over the forecast period. Further, rapid urbanization and growing industrialization is also anticipated to foster the growth of steam boiler system market globally. However, high initial investment associated with the installation of steam boiler system is anticipated to dampen the growth of global steam boiler system market over the forecast period. Moreover, high maintenance associated with steam boiler system is expected to hamper the growth of this market.